Teacher strikes may have succeeded in boosting pay for union members, but they are costing hundreds of support staffers their jobs, according to a new report. Labor Union Report, a project of former union organizer and labor consultant Peter List, has found that hundreds of librarians and other staff members will be laid off in the wake of mass teacher walkouts. 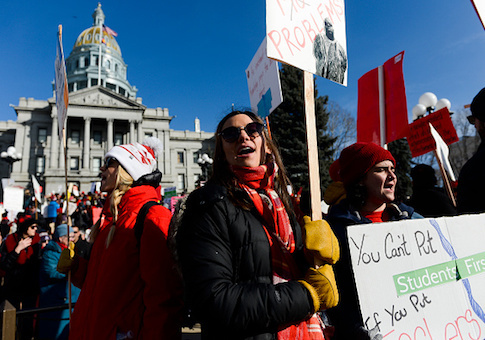 Strikes have proven effective bargaining tactics for union members, garnering larger pay increases, smaller class sizes, and a crackdown on traditionally non-union charter schools from Los Angeles and Denver to Oakland and West Virginia. They have also left school districts scrambling to make cuts elsewhere. In Denver, the school system's central office is expected to "cut more than 220 positions." Those cuts are expected to generate $17 million, a portion of which will be used to pay for the 7 to 11 percent pay raises the union negotiated during its shutdown. In Oakland, 257 positions will be eliminated to save the district $22 million in the next fiscal year. Those jobs will come from beyond its administrative offices and include district secretaries and librarians. List expects these stories to expand as other unions weigh using strikes to extract concessions from school districts. "As teachers across the nation continue to push for higher salaries and school districts agree to those demands, school budgets become strained," List writes. "As a result, cuts seem inevitable." Other labor watchdogs are concerned that the spread of strikes will distort public policy. School officials are held accountable by city residents, while union officials only have to respond to their members. Patrick Semmens, spokesman for the National Right to Work Foundation, said union officials are focused solely on the paychecks of dues payers, rather than taxpayers or non-union education workers. When districts do not push back, they will have to make cuts elsewhere. "These cuts demonstrate the danger of letting union bosses dictate education policy by using strikes to hold the public hostage," Semmens said. School cancellations and other disruptions associated with walkouts generate public pressure on district officials or other elected policy makers, rather than union bosses. Semmens pointed to West Virginia, the site of two statewide teachers strikes in the past three years. Public officials killed education reform legislation to placate union demands. Striking has given union officials veto power of how the education system is run, according to Semmens. "Elected officials who are accountable to voters should be the ones determining how tax dollars are allocated in the public education system, not teacher union officials who always put their own power ahead what’s best for students," he said.